I have had a dog since I was 4 years old. 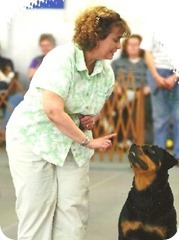 I became involved with dog training about 9 years ago. This adventure started with my first Rottweiler, Hoss. It is in his honor that I am given the opportunity to pass on all the knowledge I have gained in the last 9 years. I am supported by a very understanding husband, the mother of 2 great adult children, 3 spoiled rottweilers , 3 “granddogs” and 2 grandcats. I have primarily trained my own dogs in obedience. Have titled them in all levels of rally, and earned a CDX, trained through Utility and am involved with multiple dogs clubs. My experience has taught me that all dogs learn differently and not all “tricks of the trade” work for every dog. Enjoyment is the key, if learning is not fun for and your dog, there is no or limited “team education”.